Some roles require you to demonstrate a sense of fun in your application - especially those that involve working with children. Our Bright Crayons résumé template is perfect for this type of role - it uses the gorgeous DK Crayon Crumble font combined with fun primary colours and a 'hand drawn' border to create just the right look and feel. This lovely font which has a 'wax crayon' feel to it is free for personal use but please do check out the licence information below in the PDF before you consider using it for anything else. Bright crayons CV/résumé template	Overall rating:	3	out of 5 based on 3	reviews. 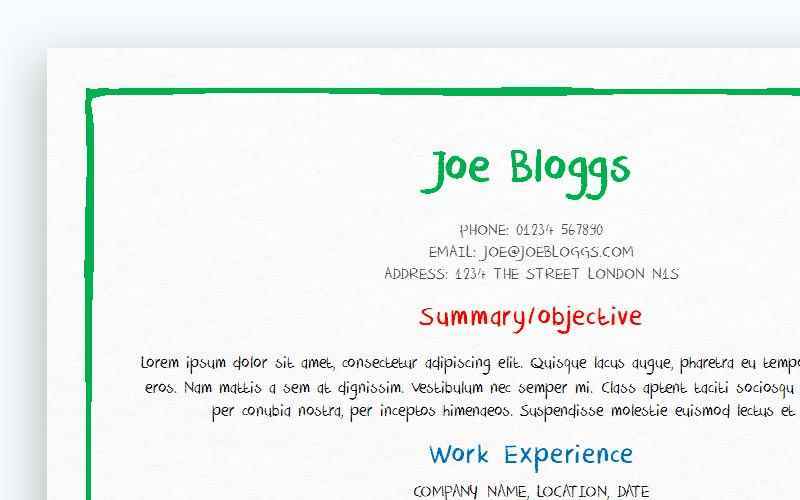 A bright, playful résumé using a really excellent font that suggests warmth, a sense of humour and a love for working with children! 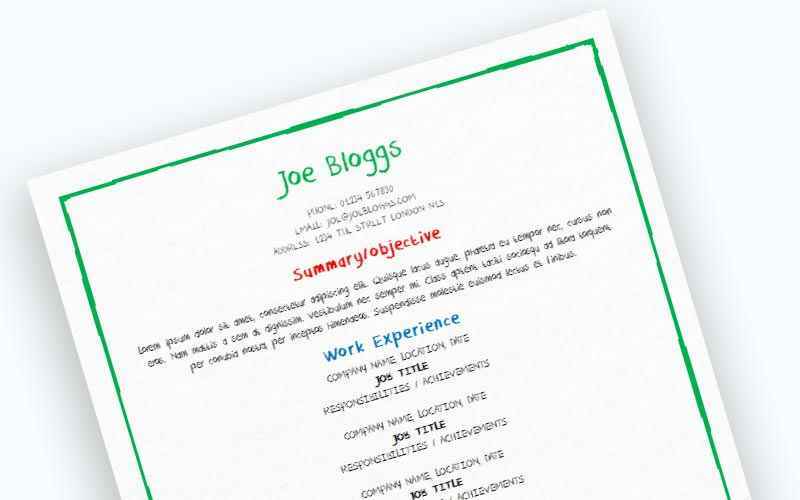 Whether you're applying to be a nursery nurse or primary school teacher, this colourful, fun résumé template will leave exactly the right impression. This template is a departure from a typical layout and only suited to certain roles. In particular, this template would work for a play worker, nursery nurse or similar role where an element of ‘fun’ is desirable. There are a few things to keep in mind when using and customising your template. Firstly – before you start – make sure you’ve downloaded the DK Crayon Crumble font. Without this, MS Word will substitute with another font that won’t fit the look and feel of this template. 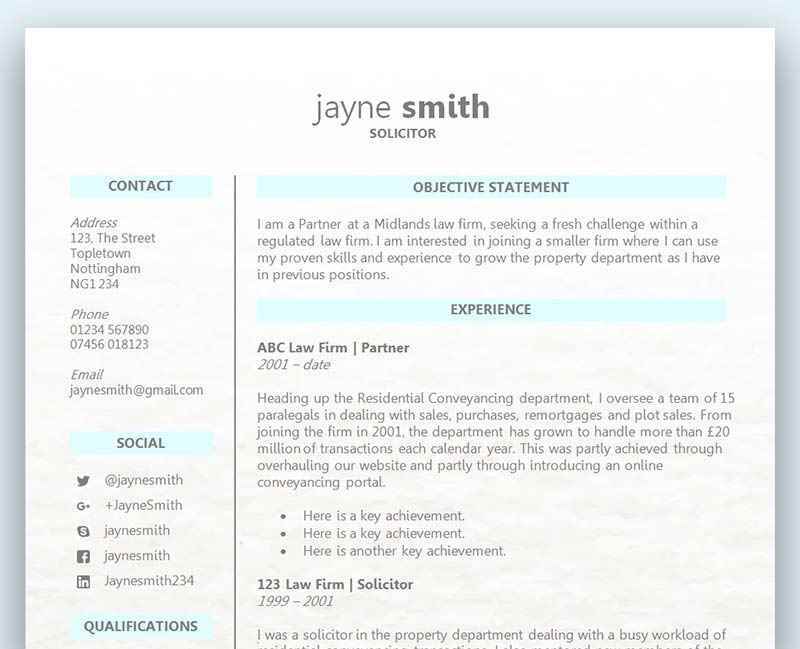 Secondly, consider carefully whether this template is suitable for the role you’re applying for. It’s a fun, lighthearted template and it might not be to every organisation’s taste. Look carefully at the job description and consider using a more professional template if you are in any doubt. Click here to view our full range of UK CV templates. It’s important to customise the template every time you apply for a role. You might be going for the same position at a number of different companies, but remember that each one will have their own requirements. Read the job specification and tailor both your CV and cover letter to what each employer is looking for. Write a punchy summary/objective statement – this goes at the top of your CV and very concisely tells the employer who you are, what you’re looking for and how you meet the job specification. In other words, it tells them in about 3 lines why they should hire you. Prospective employers spend just a few seconds looking over each CV – and this is your best opportunity to grab their attention! Don’t ignore the hobbies section – this is where your personality shines through. Mention any hobbies you have that are desirable from an employer’s perspective – such as fitness and sports. These type of hobbies show you take an interest in your health and suggest you’ll be less likely to phone in sick. Leave off any hobbies that might worry an employer (such as drinking and socialising). It’s also a good idea to leave off anything particularly quirky (you can share these hobbies with your coworkers down the line, when you’ve got the job!). Your would-beemployer wants to know that you’ll fit in with their current team and if a candidate is into beetle fighting, newsraiding or extreme ironing, it hints that they might be a bit of an oddball.